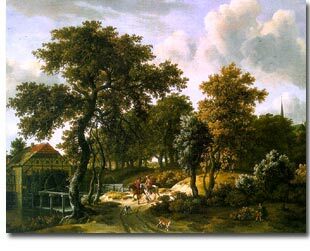 Meindert Hobbema (1638-1709), van Ruisdael's pupil and friend, was equally neglected during his lifetime. He died poor, his pictures, if sold, fetched but a few guilders, so that most of those now extant are found in England. Only a few, but these of the best, are found in the Dutch Galleries. His landscapes are somewhat brighter in tone than his master's, and more indigenous to the soil, his waterfalls being confined to the spattering foam tumbling from a water-wheel. Wooded dells, often sunny, with an occasional pool of water, or a mill were his favourite haunts, which he portrayed with genuine simplicity, brightened by a casual flicker and flash that is exceedingly attractive.